Pen, ink and paper. Three of the most common tools that every creative person uses. However, with the advancements of technology and the presence of many software and digital applications, creativity is now applied using a mouse, a pen tablet or some pixel magic. While most people jump into creating their works straight into digital forms, there are still some who do it the traditional way, letting the old pen, ink and paper as their primary tools in bringing those creative ideas into life. 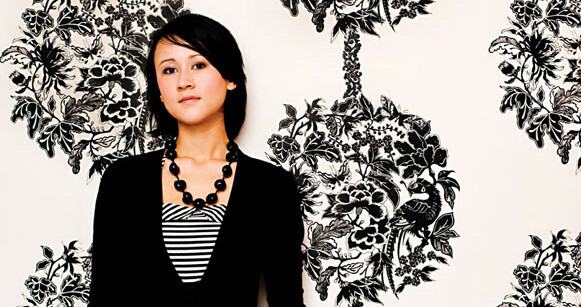 Meet Johanna Basford, an illustrator and ink evangelist from United Kingdom whose works are created solely using ink pens on paper characterized by floral elements, swirls, natural themes and delightful characters all in black and white with attention to awesome intricate details! As YTD’s featured artist of the month, we got the chance to talk to Johanna about her illustration career, her major influences and creative process. Check out the interview below. YTD: Hi Johanna, how are you and how’s UK? JOHANNA: Lovely thank you! Scotland is still a bit chilly, we’re hoping for some sunshine soon though! YTD: Tell us a little background about you and your creative work. JOHANNA: I’m an illustrator and ink evangelist who prefers pens and pencils to pixels. I create intricate, hand drawn illustrations predominately, although not exclusively, in black and white. My creativity is cultivated by a curious imagination and a delight in the fantastic. Much of my work has roots in the flora and fauna that surrounded me growing up on my parent’s fish farm in rural Scotland. I graduated in 2005 from Duncan of Jordanstone College of Art and Design in Dundee with my degree in Printed Textiles and a portfolio stuffed with monochrome silk screen prints and drawings. Following that, I set-up my little studio and began on my mission to vanquish the vector and champion the (wobbly) hand drawn line. YTD: How do you usually start your day? JOHANNA: With lots of cups of tea and a bit of list writing. YTD: When did you start drawing? JOHANNA: I’ve always loved drawing. When I was little I would draw on books, walls, myself, my sister, my clothes… luckily my parents nurtured this passion instead of telling me off! JOHANNA: LOTS. At school I loved the intricate ink work of Escher. These days I find I’m drawn to a wide ranging pool of creative work, from florists, to fashion, Street Art to packaging, Tattooists to Stationery design. I think we take little snippets of the dozens of things that catch our eye each day and store them away for future use. YTD: Describe to us your workplace. JOHANNA: Light and airy. I don’t like clutter so I try to keep my desk clean – when you’re working with pens and pencils and large sheets of paper you need room to move elbows etc. We live in a converted farm in the country and the studio has large windows that overlook the surrounding fields. I’ve got a big desk, lots of pens and pencils and of course my scanner and laptop for doing the final digital tweaks to the drawings (usually erasing tea splashes and smudgy fingerprints). I don’t like to throw away drawings, so I’ve got a two plan-chests stuffed to breaking point with every drawing I’ve made in the last five years. My extensive pen collection takes up several plastic storage boxes stacked up in one corner. I’ve got hundreds, but you can never have too many. YTD: Almost all of your works are in black and white. Any specific reason why? JOHANNA: I’ve been told, “You’d get more jobs if you worked in colour” more often than you’d imagine, but I just don’t believe it. I’m ‘that girl that does the black and white’. Add CMYK and I’m… well, just another illustrator, surely? Personally, I believe a signature style is something I have deliberately carved out. I believe it is at the very core of my practice. I set out to try and become the very best at my chosen niche – I wanted people to see a black and white drawing and wonder if it was mine. YTD: Can you share us your creative process? From where do you start? JOHANNA: Every piece I create starts life as a simple pencil sketch, evolving into a rambling pen and ink drawing usually spanning several sheets of paper. I love the tactile nature of the materials I use and the joy of smudgy fingerprints. My delicate hand inked designs intend to charm and delight, inviting you to peer closer and discover the hidden intricacies. YTD: What is your most memorable project so far? JOHANNA: The cover for the Edinburgh Festival Fringe programme. YTD: What are your tools of the trade? JOHANNA: Mechanical pencils, Steadtler pigment liners, layout paper, an A3 scanner, my Mac and Photoshop. YTD: Have you ever thought of creating your drawings in fully digital? YTD: Any major brand/designer/artist in mind you wish to collaborate/work with in the future? JOHANNA: Lots! I’d love to create a window display for Selfridges, album artwork for an amazing artist list Emile Sande, a cover illustration for Vogue, an inky airplane, an Hermes scarf and a piece for Maggie Centres. YTD: How do you deal with creative block? YTD: Tell us something about Wonderbeasts. JOHANNA: My first Kickstater project saw me team up with a merry band of co-creators – together we made Wonderbeasts! My inky comrades provided the artistic direction by suggesting creatures for the canvas and I dually obliged. The finished piece spans just over 2 meters – my biggest ever drawing! Had it not been for the good folks at Cult Pens supplying me with a stack of Stedatler pigment liners, I’d have run dry within 2 days. Wonderbeasts will form part of my solo show at the DCA, (opening on the 4th of May) This will be the only place you can see the final piece in all it’s full scale inky glory! We’re busy preparing the web version, which will have each co-creator tagged to their suggestion – this will go live in early May when the exhibition opens. YTD: If you are not an illustrator today, what would have been your work and why? JOHANNA: A florist, because I adore blossoms! YTD: Where can we find more of your works? JOHANNA: More works Here. My client list here. YTD: A piece of advice to aspiring illustrators out there. JOHANNA: Work hard, be nice. YTD: Thank you Johanna for spending some time with us. Anyone you would like to be thankful for? JOHANNA: Dundee Contemporary Arts – for inviting me to show my first ever solo exhibition! Got inspired? Feel free to tell us your thoughts about our latest featured artist by commenting below. Stay awesome everyone!